According to findings by the International Energy Agency, it is estimated that a 5% lowering of demand would have resulted in a 50% price reduction during the peak hours of the California electricity crisis in 2000–2001. As energy consumption rises, energy producers and utilities must deploy Demand Response (DR) programs to help reduce peak period pressure on the utility infrastructure. Current DR schemes are implemented with both large and small commercial as well as residential customers, often in response to a request by a utility or market price conditions. Services such as lights, machines, and air conditioning are reduced according to a preplanned load prioritization scheme during the critical timeframes. Under conditions of tight electricity supply, DR programs can significantly decrease the peak price and, in general, electricity price volatility. Successful DR programs have demonstrated significant load reduction and cost savings. With smart metering and smart grid technologies becoming more common, DR programs can be optimized to receive streaming data on supply/demand characteristics and pricing inputs. Smart grid applications increase the opportunities for DR by providing real-time data to producers and consumers, but the financial, regulatory, reliability, and customer satisfaction incentives remain the driving force behind the practice. Customers need timely information on their daily energy use and its cost, their individual impact on the environment, how they compare with their direct peer group, and actions they can take to be greener. OI solutions make DR programs more flexible, responsive, and manageable through real-time information sharing between the regulator, generator, and consumer. OI solutions improve the ability of electricity producers and consumers to communicate with one another and make decisions about how and when to produce and consume electrical power. Ultimately, an OI solution allows customers to shift from an “on-demand” DR, where the utility requests the shedding of load, towards a more “continuous” DR, where the customer sees incentives for controlling load all the time. With an OI solution, customers who traditionally pay a fixed rate for consumed energy (kWh) and requested peak load (kW/ month) can set their threshold and adjust their usage to take advantage of fluctuating prices. Large (industrial) customers with generation capacity can closely monitor, shift, and balance load in a way that allows them to save peak load and not only save on kWh and kW/month, but also be able to trade what they have saved in an energy market. An OI solution allows generators and loads to interact in an automated fashion in real-time, coordinating demand to flatten spikes. Customers can participate in energy-saving DR programs, where they voluntarily allow the energy utility to send a signal to the smart meter or other device to temporarily make an adjustment in energy usage. Meters can also capture electricity usage more accurately so that customers can have highly accurate records of their consumption, which, in turn, enables energy and utilities firms to determine how much energy they need at any given time to help lower their purchased power cost. Eliminating the fraction of demand that occurs in these spikes eliminates the cost of adding reserve generators, extends the life of equipment by reducing wear-and-tear, and allows customers to cut their energy bills by instructing devices to use energy only when it is cheapest. Vitria OI enables proactive DR programs that optimize energy usage choices based on price signals, demand requirements, and other factors. 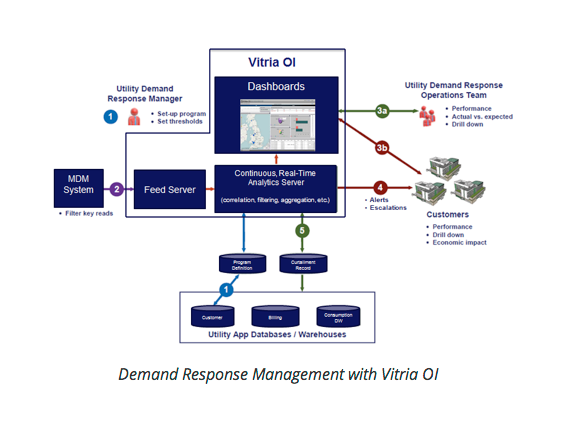 With Vitria OI, energy and utilities firms running DR programs benefit from continuous, real-time insights into operations and program performance. Fully service-oriented architecture (SOA) compliant, Vitria OI can seamlessly integrate with existing IT systems. Solution function, capacity, and interoperability can be extended without disrupting existing workflow. 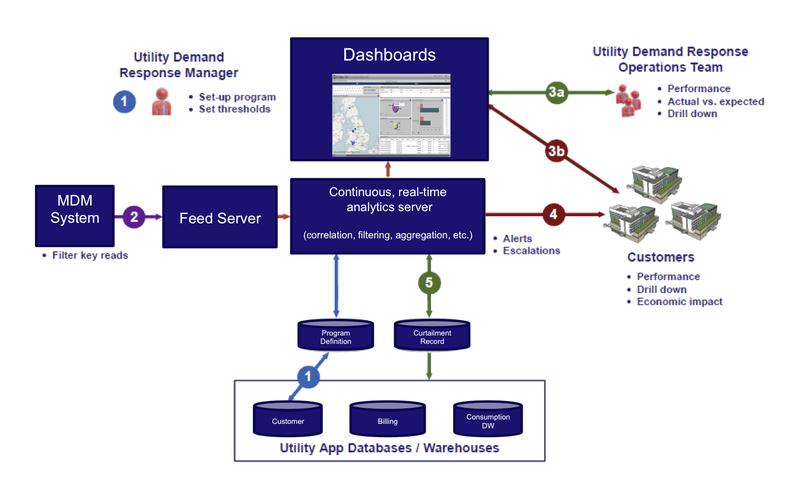 Smart grid operators can subscribe to automated alerts and notifications on usage and cost, as well as user-configurable threshold or event alerts. Customers can receive real-time notifications of events, unplanned billing variances, and power incidents. Vitria OI’s streaming analytics engine allows the correlation of events coming from various data sources, such as SCADA systems, sensor streams, and historical data repositories. Events and alarms are then generated as a result of the application of business rules to the data. With Vitria OI, energy and utilities firms are empowered to identify the right combination of customer attributes, incentives, and actions to optimize DR program results.